Tamlite Lighting, one of the UK’s leading manufacturers and designers of lighting, is launching a versatile new range of long-lasting LED light fittings, designed to cope with the varying demands of the retail and hospitality sector, while delivering savings on energy and maintenance without any compromise on light quality. Whether the priority is energy efficiency, lamp lifespan or pure aesthetics, Tamlite’s new ‘performance’ range of LED downlights and spotlights includes a solution for achieving it – and all while maintaining the excellent light quality that’s non-negotiable in spaces where the customer is king. Part of Tamlite’s 2020 portfolio of products for the projects and specification market, this range has been developed with the demanding requirements of designers, architects and installers in mind. This is why each of the products bears the INFINITY mark of assurance, which identifies LED products that meet technical standards for excellent light quality and high performance. Boasting a typical CRI of >80, the accurate colour rendering of the products, in particular, means that the colours and details of merchandise and interiors appear as they really are under the lights. 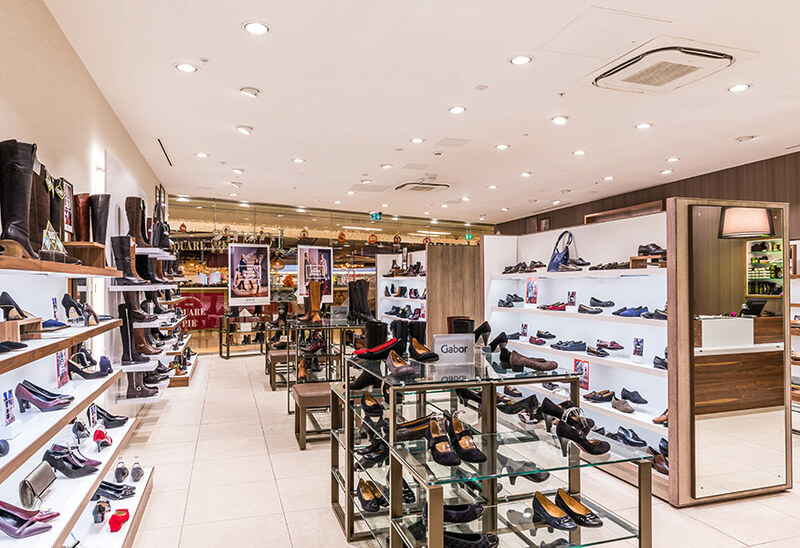 Versatility is crucial in retail lighting, which is why the Tamlite 2020 portfolio of products offers a wide range of sizes, styles and light levels, with options for dimming and DALI compatibility, and solutions designed to minimise glare. All of this is achieved alongside typical lifespans of 50,000 hours and extremely low energy consumption, thanks to high-quality Philips components. The ULTRA LED recessed LED downlight offers the ultimate in quality components, including a Philips ‘Fortimo’ DLM LED module and driver. Circular in shape, this LED downlight is available in two sizes (200mm diameter and 260mm diameter) and six different light levels. The versions range from 12W to 34W and produce light outputs of between 1085lm and 2961lm. The average efficacy of 87lm/W affirms its impressive energy efficiency and long lifespan. Producing comfortable, white light, the ULTRA LED is available in either neutral-white (4000K) or warm-white (3000K). Options for dimming and DALI compatibility add to the product’s flexibility. Also benefiting from a high-quality Philips ‘Fortimo’ LED module is Tamlite’s TMH-G LED downlight. Fully adjustable up to 350º in terms of rotation and 45º in terms of tilt, it is ideal for directing light precisely where it’s needed. The circular TMH-G, which is available in light hues of either warm-white (3000K) or neutral-white (4000K), measures 205mm in diameter. Two versions offer different levels of brightness. The 23W version produces 1700lm of light output, achieving an efficacy of 75lm/W, while the 32W version produces 2600lm of light output at 78lm/W efficacy. With an expected life of 50,000 hours and a 5-year warranty, both versions represent guaranteed high performance. With options for dimming and DALI compatibility, the 2020 DL recessed LED downlight offers energy efficiency alongside the added bonus of easy lighting control. From its diameter of 100mm, the circular 2020 DL produces a neutral-white light (4000K). Again featuring the Philips ‘Fortimo’ LED module and driver, this 20W downlight is able to produce 1600lm of light output, achieving an efficacy of 80lm/W. The track mounting of the EUROPA LED spotlight adds versatility on top of high performance, allowing you to position the light to suit the exact needs of a particular space. Measuring 230 x 190mm, it is supplied with a single circuit track adapter as standard, and it also comes with the option of a 3 circuit track adapter. Available in black or white, the EUROPA LED produces a neutral-white light (4000K) from its Philips SLM module and integral driver. The 19W spotlight boasts a light output of 1700 lumens, with an impressive efficacy 89lm/W. What’s more, with an expected lifespan of 50,000 hours and a 5-year warranty, it promises minimal maintenance requirements. Retail and hospitality environments have strict demands when it comes to flexibility, versatility and quality of light. Fortunately, with Tamlite’s 2020 portfolio of products, LED is now able to meet these demands and deliver energy savings and long lifespans to boot.